Snuggling up to read at bedtime is always a favorite part of the day. 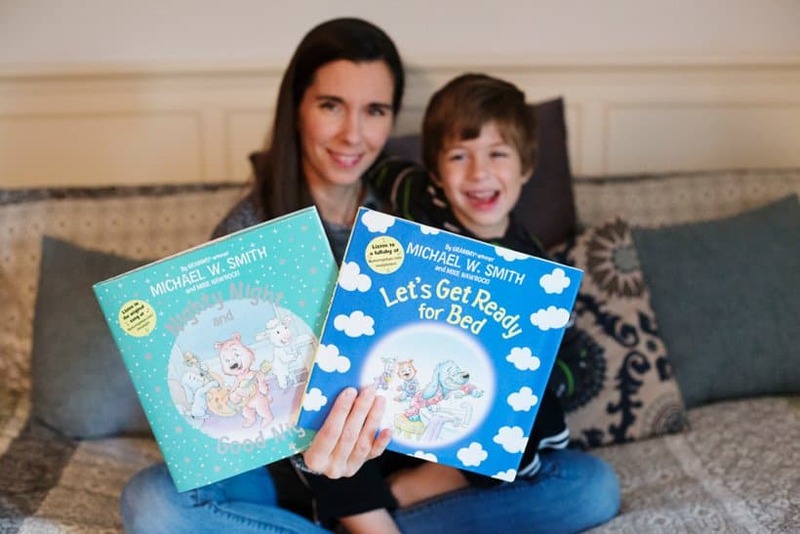 I grew up listening to Michael W. Smith’s music, so when I heard that he was writing children’s books I couldn’t wait to check them out! Michael W. Smith teamed up with VeggieTales co-creator Mike Nawrocki to create the Nurturing Steps™ series. 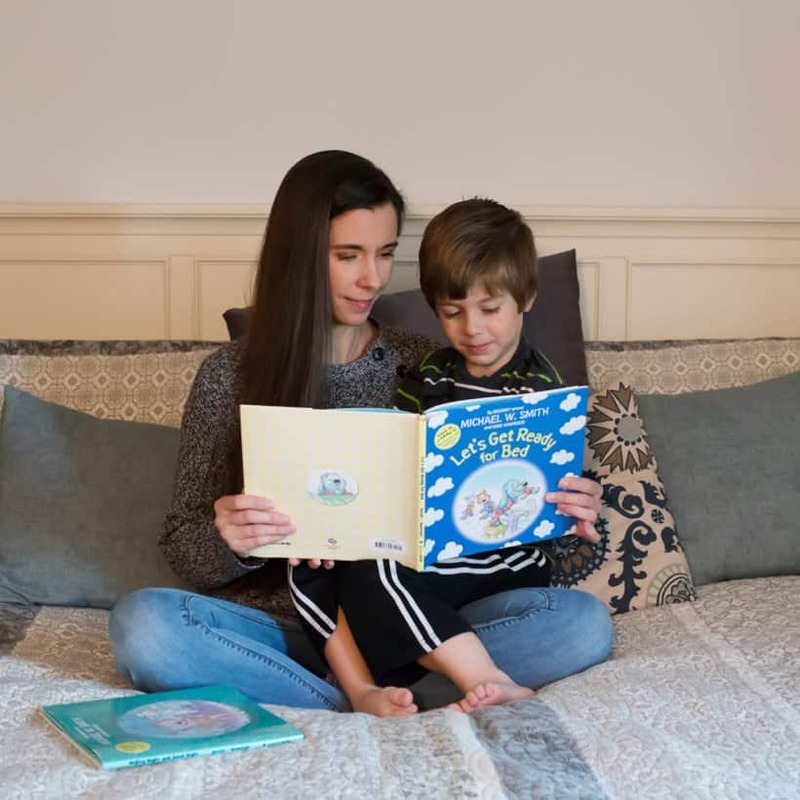 These books are created for infants and toddlers with the mission of providing families with books and music that will enhance young children’s journeys of hope and faith through storytelling and music. 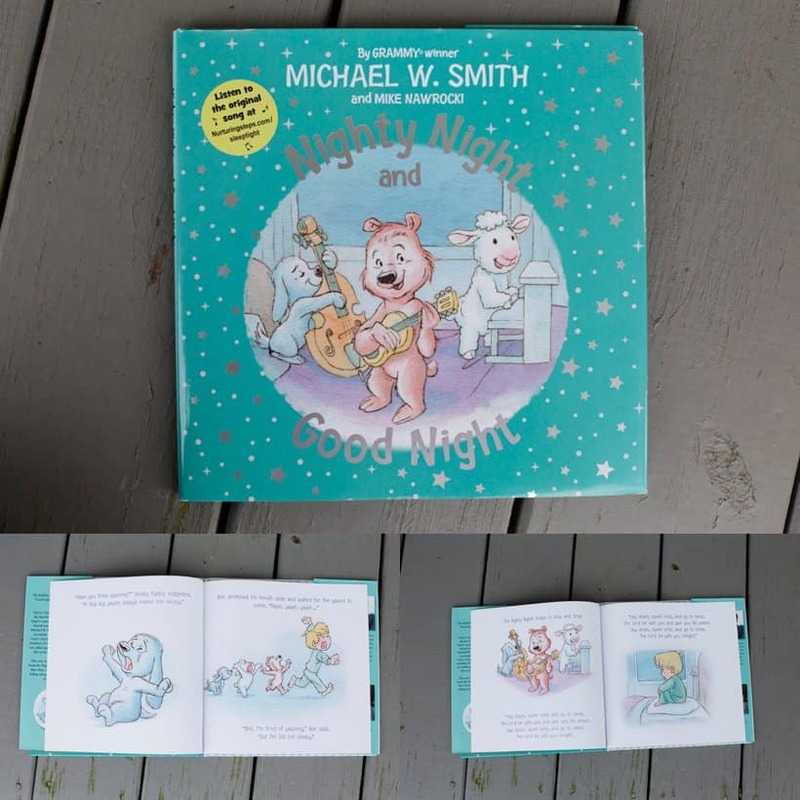 The first Nurturing Steps™ book is Nighty Night and Good Night which tells the story of how a stuffed animal band, called the Nighty Nights, help their friend Ben try to fall asleep. Lamb, Bear, and Sleepy Puppy go on a adventure in which they realize that a lullaby might be just the thing to help Ben fall asleep. 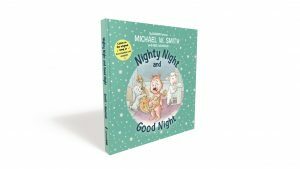 The book includes a link so that readers can listen to Michael W. Smith sing the lullaby that helps put Ben to sleep. The second Nurturing Steps™ book, Let’s Get Ready for Bed, in which the Nighty Nights get ready for bed and help their friend, the not-so-sleepy, Sleepy Puppy drift off to sleep. This book also includes a link to listen to the lullaby from the book, sung by Michael W. Smith. 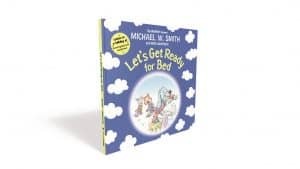 Learn more about Let’s Get Ready for Bed by watching this trailer. What a great way to end the day with your young child. 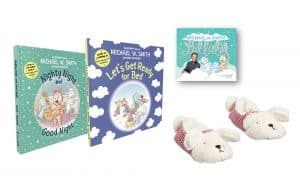 Snuggle in and read these adorable books, and then listen to the lullabies together as your child begins to drift off to sleep! You can win an awesome prize package for your child, or a child you love. Enter below! Let’s Get Ready for Bed Giveaway! To enter simply leave a comment on this blog post telling me who you’ll be reading these adorable Nurturing Steps™ books with! Giveaway begins immediately, and ends at 12:01 am on December 14th, 2018. I would read these with my 4 year old grandson. I will read these to my HERO who got hit by a IED but is my HERO for life. My youngest princess, Henley Grace! She love to snuggle and loves to read. I will be reading them to my daughters. I love Michael W. Smith. Thanks for the chance to win. I will read them with my friend, Carolyn, niece Veronica. Our children and grandchildren are grown for the most part. I’ll be reading to my grandchildren Jackson and Madison. I'd read it to my niece. If I win I'll be reading the book to my daughter Izzy! We read every night before bed, and are always looking for new books. I will read to my two young granddaughters who have regular sleepovers at our house! I'll be reading them to my grand-daughter! I'll be reading these to my grandson. I will be reading these to my five grandchildren! I will be reading these to my daughter! I will be reading them to my granddaughter that lives with me. Thank you! My 1o month old Grandson! He loves to have us read to me. My cousins new baby boy! I will read them to my sweet niece who is due in a few months. Hi...so cute! I will be reading to my little granddaughter who loves to snuggle. If we won this contest, I would read the books to our daughter Gianna as part of our continued bedtime routine. She looks forward to reading books every night before bed. I would be reading these books to my grandson and soon to arrive granddaughter! My first grandbaby. He just turned 1. I'll be reading these with my adorable granddaughter, Nellie! She is 8 months old and loves having someone read to her. I would be reading to my 3 year old Grand Daughter and 4 year old Grandson, when they spend their weekends with Grandma! I would read them to my 2 year old grandson when he comes to visit. My y year olds love to read and will be reading to my 1 year old soon enough! I would read these with my son! He would love them! I will be reading to my 3 wonderful children, ages 5, 3 and 1 they love books. My grand kids love books and being read to. These new books would be so much fun for all of us to read. My grand daughter, Angalisia, Grandpa Poppy and I will sit by the fireplace reading these delightful books. I would read this to my precious 5 year old son, Tucker, who has a very hard time sleeping. My daughter Bree is 8 and will love them. She is obsessed with books. She is also going to be an Aunt in March and it would be so cute to watch her read to the new babe. My best friend, who is also my favorite 3 year old's mom, just found out that she's expecting triplets! I can't wait to read these books with FOUR perfect little angels! I will be reading this to my son! I would read this to our youngest snuggle-bug, Blake! I'll be reading with my 3 youngest girls!! Special times! I will be reading to my 5 year old son, Ethan. He loves story time! I will read this to our youngest snuggle-bug, Blake! I would read these to 3 small children. They love when I read to them. ill be reading these with my daughter!!! If i won i would be reading them to my kids. Reading to them is really important to us and they would love these books. Thanks for the chance to win. So cute, I would be reading to my two sons (2.5yrs and 9mos). I would be reading this with my 3 year old almost 4 year old son! He loves to read at night before bed. My 3 children! My 6 year old is learning to read on her own and loves it. My 1 year old just loves books and being read to. And I enjoy reading to my 4 month old as he just looks at the pages. We love reading every night after school. Definitely my niece and nephews! These are adorable! I'd read to my 5 year old son. Benjamin loves books just like his mama! I would be reading these to my toddler! My own kiddos are older so I would read to my daycare kiddos. I would read these with my 2-year-old grandson. You are the winner! Congrats! I would read it with my 6 year old. I would be reading this to my two little girls, they adore story time...and I adore reading to them because how magical is it that they are so interested with the new upcoming where no children are because they rather have a phone/TV. Thank you for this chance. I would read it to my boys, Keagan and Nolan. I would read these to my 3 year old granddaughter. I would love to share these with my new grandson!! I would be reading these gifts to my little ones who are 6 and 7. This would be nice to read to my great nephew. I would read them with my nieces. I would love to read this to my sweet new granddaughter who is now 1 month old. I would love to read these with my grandchildren when they are with me every week. I would read them to my Grandchildren; Austin and Ella, both 4 years old. They love Mamaw to read to them! Thanks for the oppurtunity! I will be reading to my 9 month old grand daughter Athena! Would read them to my little cousin. I'd be reading with my two sons. I would be reading these with my 4 children. We do bedtime stories every night. ❤ We don't have these one's in our little collection so they would be an amazing gift for them. ❤ They are 9 years old, 6 years old, 5 years old and 4 years old so they are either reading or learning to read so these would work perfectly for them to practice. I will be reading with my son! I'd love to read these sweet books to my 3 beautiful children. I would read these with my daughter! I would read to my grad daughter Amelia!